Hello all! I hope everyone is having a happy Sunday! Whether it be enjoying the sunshine or cozy-ing up inside, out running around or in being lazy, being with family and friends, or even just quietly recovering by oneself from a tough week…hope you are well! When The Vanilla Company heard I was having this giveaway they decided to donate more beans to my little raffle. Thanks to them, we now have two winners instead of one! Each winner will receive 1 pack of Tahitian vanilla beans, 1 pack of Bourbon vanilla beans, 1 Gold Label Tahitian vanilla bean, and one The Vanilla Company shopping bag. More loot than I had originally planned…YAY for the winners! So, without further dithering about, the lucky winners are…Laura of The Spiced Life and Midge of Sybaritic Diversions!!! Congratulations to you both! – Whisk the flour, baking powder, and salt in a medium bowl until fully incorporated and no lumps remain. – Place the butter in the bowl of a stand mixer fitted with a paddle attachment and beat on medium speed until creamy and smooth, about 1 minute. Add the sugar and vanilla seeds and beat until light and fluffy, about 2 minutes more, scraping down the sides of the bowl occasionally. Add the eggs to the mixture one at a time, beating until incorporated before adding the next egg. – Reduce the mixer speed to low and add the flour mixture in two additions, mixing each until just incorporated. Do not over-mix. – Spread the batter into a buttered and floured loaf pan and bake in a pre-heated 350F oven for 45-50 minutes or until a skewer inserted in the middle of the cake comes out clean. Transfer to a rack and let cool in the pan for 10 minutes. Run a knife along the edges of the cake and remove from the pan, letting it cool completely on the rack. This unassuming loaf is the perfect way to try out vanilla beans if you are using them for the first time. It is easy, quick, doesn’t require multiple steps (like this), and lets the vanilla beans shine. I, for one, am a lover of plain, unfussy, yellow cakes, especially of the loaf variety, and this cake’s buttery vanilla crumb has definitely endeared itself to my heart. Despite the harried and harrowing past couple of weeks, I am determinedly psyching myself for the week to come. And, in my humble opinion, nothing sets you right for Monday than cake and free vanilla beans on Sunday. Congratulations once again to the Laura and Midge! Woo-hoo!!!! So exciting!!! And I was just thinking I needed to find more vanilla beans! 😀 THANKS! Definitely the next dessert I will cook! Looks delicious! That Pound Cake looks absolutely delicious, I am hoping mine turns out to look this way. Oh, wow… this pound cake looks FANTASTIC! This is a really cool website, too. Breakfast food! Great idea!! Did I tell you pound cake is my favorite cake? 😀 This looks good. How do I follow your blog? Hi, Joey! Thanks so much! (I've emailed you, by the way.) Have you ever heard of quatre-quarts? It's a classic French pound cake which involves oodles of vanilla and soaks up a lovely vanilla bean syrup. 😀 It's utterly amazing, keeps well, and makes for lovely presents for the Holidays. Oooooh this looks delish! Coincidentally, I just baked a vanilla pound cake today, too. And I was debating whether I should add YOUR dulce de leche between the layers! Should I? 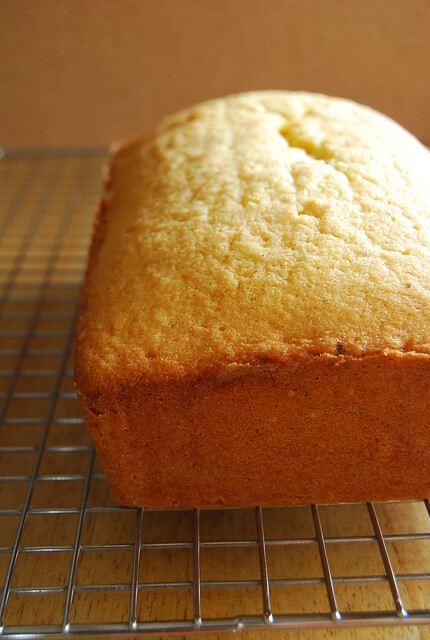 Thanks for sharing your vanilla pound cake recipe,Joey! It's terrific! Can't go wrong with a classic pound cake like this! This one makes me swoon and dream of pomp and pageantry! I love the simplicity if a vanilla pound cake – add a couple fresh strawberries and vanilla bean whipped cream and you've got yourself a dessert to entertain with! Hi V Shaw! Thank you 🙂 I am sure it will be lovely! Hi Dexie! Really? I love it too! Hi Betty Ann! What a coincidence! What can I say, great minds think alike 😉 I am sure it would be awesome spread with dulce de leche! This vanilla bean cake recipe looks very delicious. It's to put my baking face on. Love this! I especially love it as a breakfast idea! Thank you for the post. 🙂 I just included a link to you in my Vanilla Bean Roundup post!